CashCrate Review: Can You Actually Make Money? If you have been looking for free ways to make money online for a while, you’ve probably come across get paid to programs, and by now, you probably have heard of a very well-known GPT site, called CashCrate. And like many, perhaps you have been looking for an honest review of CashCrate to find out once and for all, if indeed it is a legitimate site or just another “make money online quick” scam. Well, you are in the right place. This review is nothing like the normal reviews you see and read online. It is based on my own personal experience. With that said, for those of you who aren’t familiar with CC, let me explain what it is, and how you can use it to make some money online. 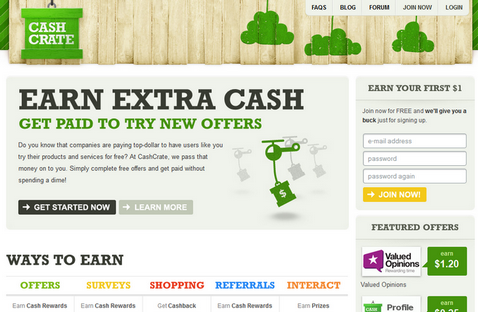 Cashcrate is basically a Get Paid To (also known as GPT) site where you can get paid to complete offers. You can take surveys, register for newsletters and free websites, do trial offers, shop, etc. GPT sites like Cash Crate get paid from companies to generate leads for them, and each time they do, the get paid for it, which then they share a percentage of the money with you (the lead). Its kind of a rewards or cash back program with one major difference, you don’t have to always buy things to get cash back! They have many free offers as well, like online surveys, and registering with different free websites and etc. I found CC a few years ago when I was first getting started in online money making, and like many other people, I too started out with taking online surveys and completing offers on get paid to sites like CC. To be honest, at first I was skeptic as well. I mean, their ads are nothing short of “too good to be true” kind of ads. But I gave it a go, as I really wanted it to work. Fast forward to a few weeks later, and me receiving my first check of $78.28, and I was a believer. Of course, that motivated me even more to spend more time on CashCrate.com completing offers left and right. I have made a decent amount of money with CC over the years. Although, these days, since I am too busy with running BlogStash and a few other sites of mine, I don’t have much free time to do that any more. But even today, whenever I have some free time, I do check out my old account. Whenever I want to shop online, their shopping center is where I check first to see if they offer any cash back or reward for shopping from the particular site I am planning to shop from. I mean, if I am going to buy something any way, I may as well earn some reward for it. So, if you ask me, I’d say it is a legitimate and reliable site. The minimum for cash-out is $20, which in all honesty, it’s not that hard to reach, considering that there are lots of high paying offers you can complete. The only downside here is their cash out system. I personally think it takes a bit too long. But from a business point of view, I guess I can understand they are trying to cut down on cheaters and frauds. I mean, think about it, if they paid weekly, they would have little chance of getting their money back, if they find out that particular member had cheated (perhaps using different IPs to complete the same offer over and over). So, by paying members 30 days after they have requested cash out, they decrease the chance of any cheaters slipping through the cracks, as they will have more time to catch up with them. Once you have $20 in your account, you can request a cash out. Each cash out is processed by the 20th of the following month. Meaning, if you earn $100 in June, your check will arrive around mid July. Don’t Quit Your Job: Ok, lets be honest here – CC is legit, and it’s a great way to earn some extra cash. But that’s about it! If you are looking to get rich, this is not for you. Don’t quit your day job yet, as doing offers by no means is going to replace your day job. It’s a very limited opportunity: Although, they do add new offers frequently, they only have some surveys and free offers you can complete and get paid for. After that you run out of offers, and the only other options you have for making money are trial offers and shopping. It Takes Some Effort: Making money with CC, like most other legitimate gpt sites, depends on a few things, like how much time and effort you’re willing to put into making money. Earn More With Trail & Shopping: Of course, it depends on how many offers are available as well. Using free offers you might be able to make a few hundred dollars a month, and if you want to take the chance to do the trial offers, you can make much more than that. Refer Friends: CC also rewards you for referring others. Each time you refer someone, you get paid a percentage of what they earn as a CashCrate member. So, be sure to take advantage of their referral program by referring your friends and family. Don’t Forget To Cancel The Trials: I would suggest sticking with surveys and free offers for making money here. But if you do decide to go for the trial offers, and make more money, be careful. Always make sure to call the company afterword and cancel your subscription. If not, your credit card will keep getting charged month after month, and you’ll end up spending way more money than what you made. In a nutshell, CashCrate is legit, it has been paying people for years, for completing offer online, and it continues to pay its members. Although, you can’t really count on it as a source of serious income, you can make somewhat of a decent money with CashCrate.